Simplicity at it’s best! With just two ingredients & 35 minutes of your time you could be tucking into this delicious Easy Coconut Tofu. Could it get any better? ……. Well yes actually…..Because it’s gluten-free, oil-free, low fat and has 10 grams of protein per serving! I was having a bad day today. You know those days when nothing goes right? After a rushed breakfast (thank goodness for make ahead Strawberry Baked Oatmeal! ), I was hurrying around the dog park with Chester before work and on glancing at my phone which is never far away, happened to notice lots of notifications on Twitter wishing me congratulations. Congratulations? What did they know that I didn’t? Well, it turns out that A Virtual Vegan has been nominated and shortlisted for Best Food Blog in the Blogger’s Blog Awards. I had no clue that I had even been nominated and it was such a lovely shock to find out that I was shortlisted amongst four others. The winner is announced on October 1st and I will be sure to let you know if I win, although I am sure that if it does happen, you will hear me screaming it from the roof tops well before I manage to type something here……. Now back to todays recipe. I told you that I had some Hawaiian inspired recipes to come. 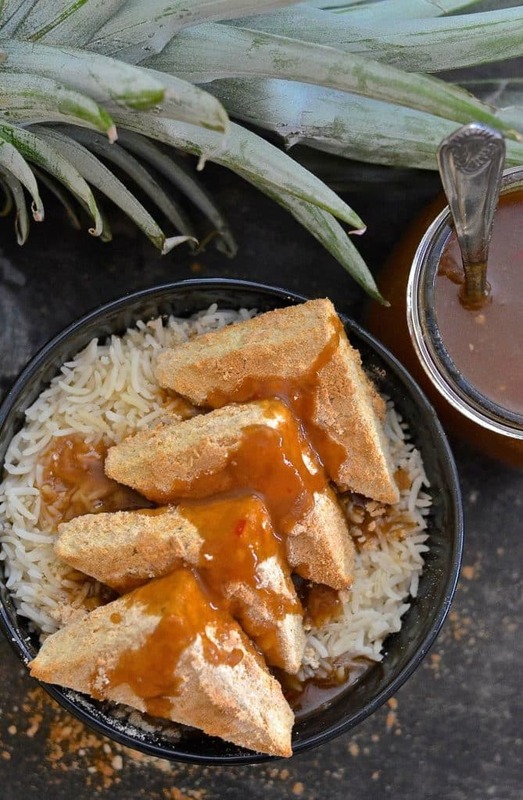 My Garlic Pineapple Sauce was one of them and this Easy Coconut Tofu recipe is another. These two recipes are a marriage made in heaven. They compliment each other so well. 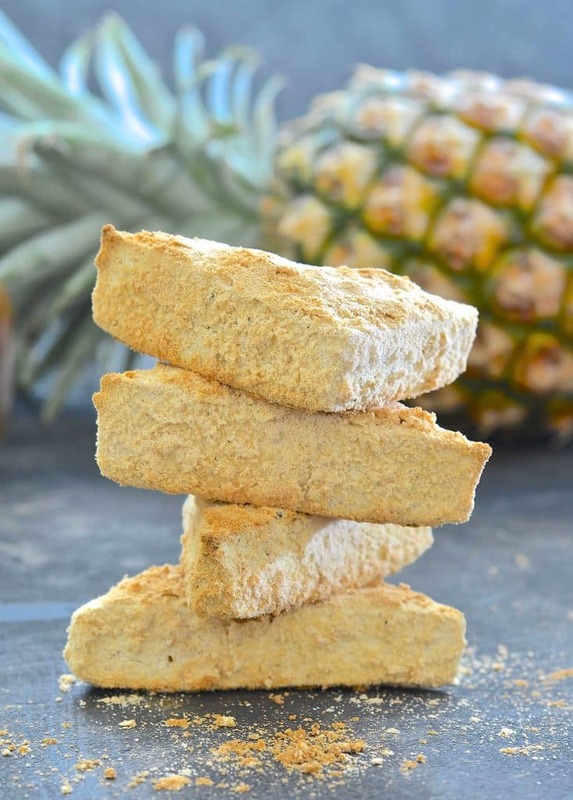 Pineapple and coconut have got to be one of the most well known flavour combos out there, right? But these recipes are also good in their own right too, hence the reason I published them separately rather than as one recipe. 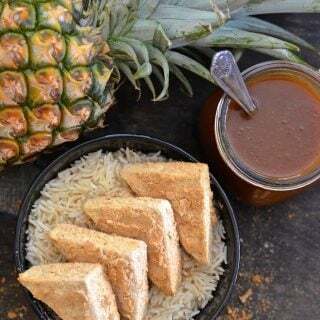 If you make the Garlic Pineapple Sauce and the Easy Coconut Tofu together, they will be ready within thirty-five minutes and most of that time will be waiting for the tofu to bake in the oven rather than hands on time. 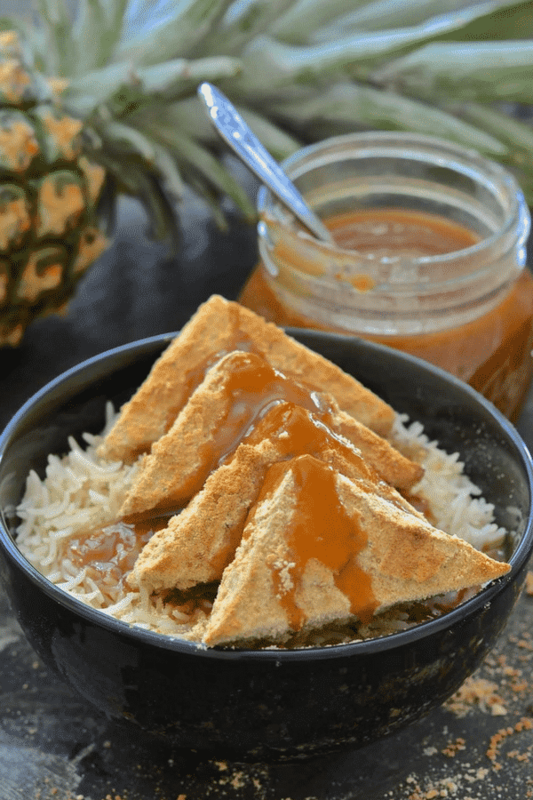 This Coconut Tofu is one of the simplest vegan tofu recipes on my website. it is quite literally child’s play to make. Open a packet of tofu, cut into triangles, do not dry it, leave it wet, then dip in seasoned coconut flour. Put on a tray and bake. It really doesn’t get any simpler than that does it? You don’t have to cut it into triangles. You could cube it but bear in mind that it won’t take as long to cook then. The triangles look good though and they somehow feel heartier than eating little cubes. The coconut flour that coats this Coconut Tofu turns a lovely golden brown colour when baked and takes on an almost nutty, slightly sweet flavour. It has a subtle flavour which works extremely well with really flavoursome sauces. Just a word of warning. Don’t leave this tofu lying around on a baking tray looking like it does in the picture above. There is a chance that someone will think it’s shortbread, grab a piece and take a big bite before they realize…….I know from personal experience and it was so funny! If you make this Easy Coconut Tofu or any of my other recipes please leave me feedback below. 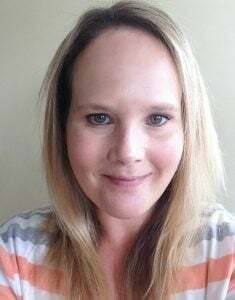 I love to hear what you think! You can also share your pics with me on Instagram too. Use the hashtag #avirtualvegan and tag me @avirtualvegan. I get lots of notifications and doing both ensures I don’t accidentally miss them. Did you know I have also set up a You Tube channel? I would love for you to check it out and subscribe. There are a couple of videos there now and I have another to add very soon. I have really enjoyed making them and hope to continue as regularly as time allows. Simplicity at it's best! With just two ingredients & 35 minutes of your time you could be tucking into this delicious Coconut Crusted Tofu. Could it get any better? ....... Well yes actually.....Because it's gluten-free, oil-free, low fat and has 10 grams of protein per serving! Put the coconut flour on a plate or in a bowl and stir in the salt and pepper so it is evenly distributed. Open the packet of tofu and drain off the liquid but don't dry the tofu. Cut the piece of tofu into ½ inch rectangular slabs. Cut each rectangle into two to make squares, then each square into triangles. Dip each triangle into the flour mixture and turn it all over until each side is covered. 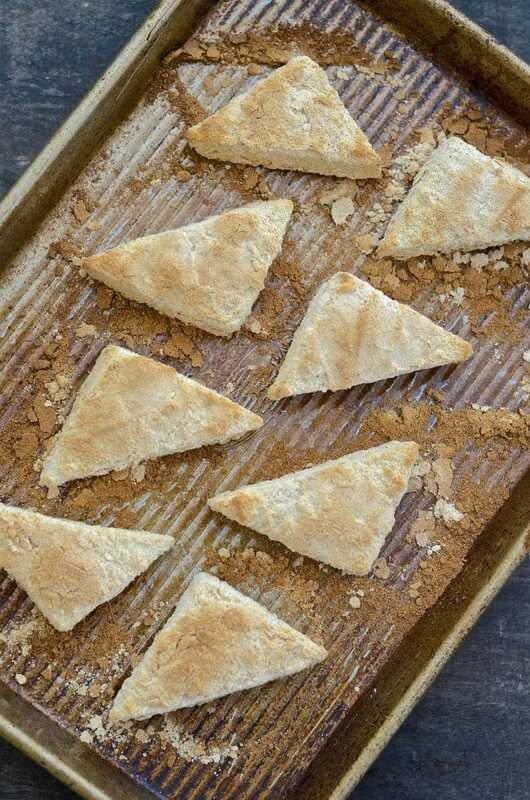 Put each triangle onto a baking sheet . Place in the preheated oven and bake for 30 minutes or until golden brown all over. You do not need to press the tofu for this recipe. The dampness in it is what makes the coconut flour stick. I always prefer the texture of tofu that has been frozen. When I buy it I throw the packet as it is in the freezer when I get home. Then I just take it out to defrost the day before I use it. I have even defrosted it in a sink of water on the day if I have forgotten to defrost it. Once it's defrosted just follow the recipe as above. If for some reason you get interrupted and your tofu dries out, just dip it into some cold water, shake off any excess, then dip it into the coconut flour to coat. If you end up with any leftovers, they can be reheated in a 350°F oven for about 15 minutes. They end up a little bit tougher than when originally baked but are still good. Most of my readers are in the U.S so the links are based on Amazon.com not .ca. I do have something installed that tries to take you to the same thing in all of the other Amazon stores, but if that product isn’t available there it chooses what it thinks is something similar. Sometimes it gets it wrong like with this. At least it got the coconut bit right though. Sometimes it will choose something completely random! Any coconut flour will do though. In the shops here on Vancouver Island a brand called Coconut Secret is commonly found. It’s in a blue pot. Maybe you’ll find that locally to save you ordering online. I can’t get the Bob’s red Mill one here for some reason. I hope you enjoy it. it’s so good with that pineapple sauce! I made this for breakfast this morning (without black pepper). It was amazing! I’m on a vegan ketogenic diet and these are a perfect low carb meal option. For other ketoers, if you use 0 net tofu (I used Trader Joe’s Sprouted) and Arrowhead Mills Organic Coconut Flour (coconut flour varies widely in net carbs), half the recipe is 4 net carbs. Satisfying and delicious! Felt like dessert to me. Thanks! So simple and easy to make. Made them an hour ago and they are all gone! Wanted to take a picture but too late! Served them with a honey garlic BBQ sauce. So happy to have found your blog and Facebook page. Finding it’s all eaten before you get to take a picture is always a good sign! So glad you enjoyed the recipe and thank you for stopping by to leave feedback. I appreciate it! First of all, congratulations! You most defintely deserve the praise and recognition! 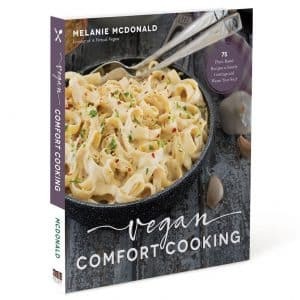 Your blog is amazing and you are helping so many people all over the world recognize the Art of Being Vegan; or, the art of making vegan food absolutely delicious. And plus you have blogs like there, where you take it to the next level, making them oil-free, gluten-free… you are just great! Thank you so much Natasha! ???? This recipe is so, so simple to make. I do usually press my tofu but for this recipe if you press all the water out the coconut flour won’t coat properly. I wanted it to be super simple hence the reason it is as it is. If you freeze your tofu first it does wonders for the texture so if you are worried about texture issues you could freeze it. Just literally throw it in the freezer in it’s packet. Then defrost and follow the recipe. I don’t find it spongy when cooked this way though. If you really want to press it, you could, then you could dip it in a bit of non-dairy milk or aquafaba before coating in the flour but then you add an extra step. Totally up to you though! Yum—we made this last week! Love tofu!!! Leftovers were great chopped up on top of a salad! Woah! That looks so good! I laughed so much I cried! It was so funny. It was my husband and he hates tofu too which made it even funnier! This tofu looks amazing. You come up with such great ideas! I’ve never really traveled anywhere tropical (I’m more of a city traveler) but this combo reminds me of the Polynesian Village at Disney World which I love visiting. I can’t wait to try it! Thank you so much. I really appreciate your vote. This recipe just kind of happened. I had coconut flour that wasn’t being used and wanted tofu for dinner. Bam…a new recipe! Is it necessary to grease the baking sheet? Good question. I should have mentioned that! I never do. Because no real moisture comes out of tofu when its baking there’s nothing really to make it stick. You could lay it on parchment paper or a silicone mat if you are concerned or if your trays aren’t too reliable but it should be fine without. I try to avoid greasing anything if I can! This sounds amazing! 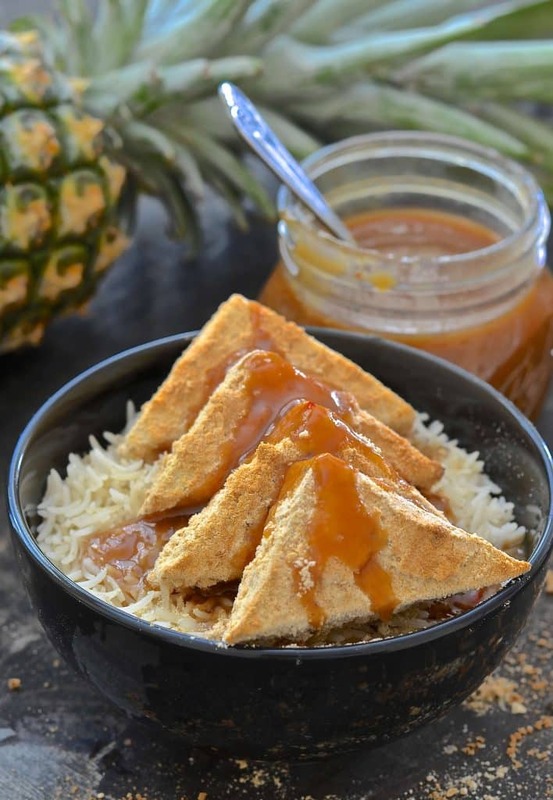 I love coconut and tofu, this is getting made soon. YUMMY!!! TOfu…i love…add coconut in it, even better…and then crispy??? I Need to try out this recipe! 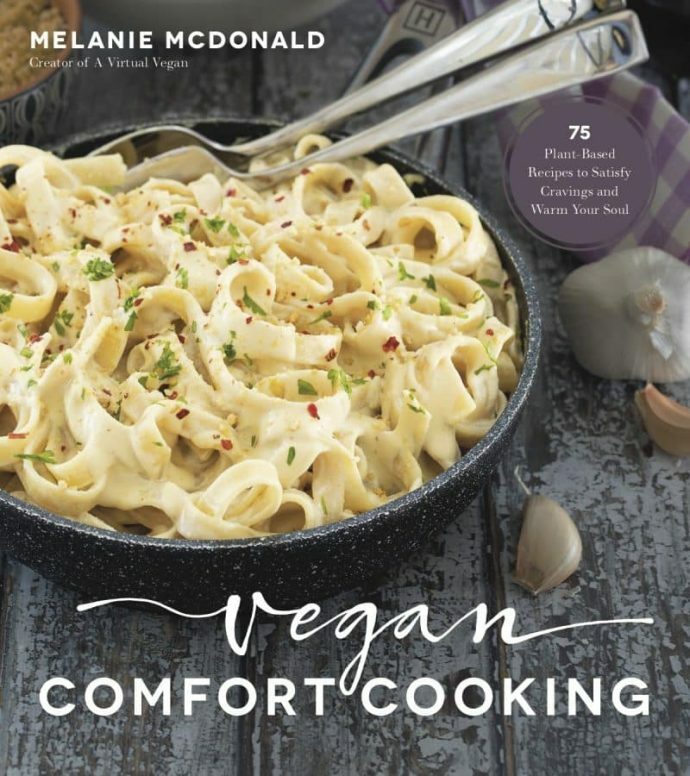 I’m a fan of both Tofu & Coconut so this was perfect! Thanks Molly. Let me know what you think if you do try it! Haha, that is so funny about mistaking the tofu for shortbread! I bet that was quite the tastebuds shock, lol! This is such a beautiful and clever way to coat the tofu. I haven’t seen that before! Be the crispy factor is so good. What a delicious coating idea! I can just imagine this with a light curry sauce – yum! You really must try freezing it. It improves it so much! I can’t wait to try this tofu. I’ve never frozen tofu before. I definitely need to try that. This looks so good! I love tofu.